Level-5, the Fukuoka-based developer behind those puzzling Professor Layton games and PS3 exclusive White Knight Chronicles, has announced an announcement. At upcoming event Level-5 Vision 2009 in late August, the developer will reveal a trio of new titles. 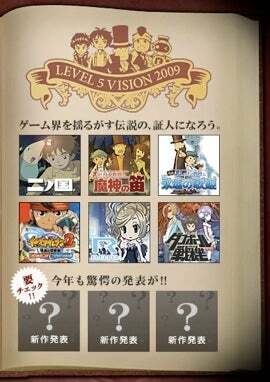 Current games that Level-5 is developing include Studio Ghibli title The Another World, a new Professor Layton game to go with the upcoming Layton anime, soccer RPG Inazuma Eleven 2, build-your-own-robot PSP role-playing-game Cardboard Senki and the company's digital distribution platform ROID. Oh! And Level-5 just developed Dragon Quest IX for Square Enix. You could say Level-5 is busy. You could say a lot of things.